A diving bell is a rigid chamber used to transport divers to depth in the ocean, for the purpose of performing work, such as the installation of pylons for bridges, tunnels, and underwater viaducts. The most common types are the wet bell and the closed bell. The wet bell is a cable-suspended chamber, open at the bottom like a moon pool structure, that is lowered underwater to operate as a base or a means of transport for a small number of divers. The pressure of the water keeps the air trapped inside the bell. They were the first type of diving chamber. Unlike a submarine, the diving bell is not designed to move under the control of its occupants, nor to operate independently of its tether. The closed bell is a sealed chamber, which may be used for mixed gas bounce diving and for saturation diving. This form of bell locks on and off the chamber where the divers live, by way of a closed door sealing the divers in at pressure. 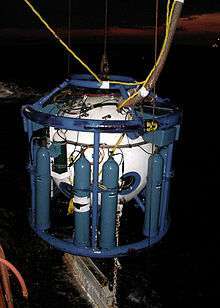 Once on the surface, the bell is mated with the chamber system and the space in between is pressurized to enable the divers to make a seal and transfer through to the chamber which is at the same pressure. In saturation diving the bell is merely the ride to and from the job, and the chamber is the living quarters. If the dive is relatively short (a bounce dive), decompression can be done in the bell in exactly the same way it would be done in the chamber. 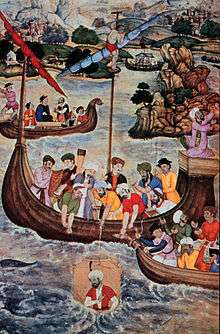 In 1616, Franz Kessler built an improved diving bell. In 1658, Albrecht von Treileben was permitted to salvage the warship Vasa, which sank in Stockholm harbor on its maiden voyage in 1628. Between 1663-1665 von Treileben's divers were successful in raising most of the cannon, working from a diving bell. In 1689, Denis Papin suggested that the pressure and fresh air inside a diving bell could be maintained by a force pump or bellows. Engineer John Smeaton utilized this design in 1789. In 1691, Dr. Edmond Halley completed plans for a diving bell capable of remaining submerged for extended periods of time, and fitted with a window for the purpose of undersea exploration. In Halley's diving bell, atmosphere is replenished by sending weighted barrels of air down from the surface. 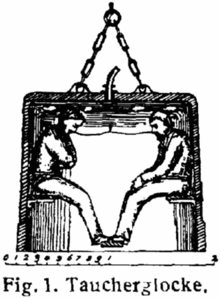 In 1775, Charles Spalding, an Edinburgh confectioner, improved on Dr. Halley's design by adding a system of balance-weights to ease the raising and lowering of the bell, along with a series of ropes for signaling the surface crew. Spalding and his nephew, Ebenezer Watson, later suffocated off the coast of Dublin in 1783 doing salvage work in a diving bell of Spalding's design. Diving bells are used as underwater search vessels and by working divers doing underwater work and salvage. 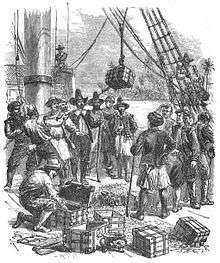 The bell is lowered into the water by cables from a crane attached to a ship or dock. The bell is ballasted so as to remain upright in the water and to be negatively buoyant so that it sinks even when full of air. Fresh gas is available for breathing by the occupants, and excess gas leaks out under the lip of the wet bell, where it bubbles naturally to the surface. As a wet bell is lowered, increasing pressure from the water compresses the gas in the bell. 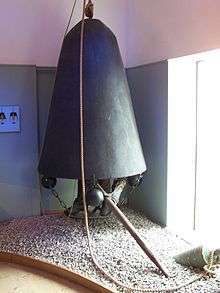 If the gas pressure inside the bell were not raised by adding gas to compensate for the outside water pressure, the bell would partially fill with water as the gas was compressed. Adding pressurized gas ensures that the air space within the bell remains at constant volume as the bell descends in the water. A similar principle to that of the wet bell is used in the diving helmet of standard diving dress, where compressed air is provided to a helmet carried on the diver's shoulders. Additional weights are carried on the waist and feet to prevent overturning. The modern equivalent of this diving equipment is used in surface supplied diving. 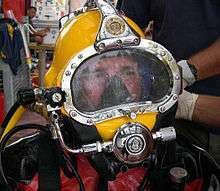 A wet sub may also provide a dry viewing chamber for the operator's head, acting as would a diving helmet. A wet bell is a platform for lowering and lifting divers to and from the underwater workplace, which has an air filled space, open at the bottom where the divers can stand or sit with their heads out of the water. The air space is at ambient pressure at all times, so there are no great pressure differences, and the greatest structural loads are usually self weight and the buoyancy of the air space. A fairly heavy ballast is often required to counteract the buoyancy of the airspace, and this is usually set low at the bottom of the bell, which helps with stability. 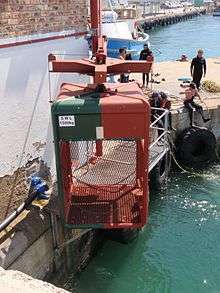 The base of the bell is usually a grating or deck which the divers can stand on, and folding seats may be fitted for the divers' comfort during ascent, as in-water decompression may be long. Other equipment that is carried on the bell include cylinders with the emergency gas supply, and racks or boxes for tools and equipment to be used on the job. The bell bottom hatch must be large enough for a large diver fully kitted with appropriate bailout cylinders, to get in and out without undue difficulty, and it can not be closed while the diver is outside as the umbilical is tended through the hatch by the bellman. It must also be possible for the bellman to lift the working diver in through the hatch if he is unconscious, and close the hatch after him, so that the bell can be raised and pressurised for the ascent. The internal space must be large enough for a fully kitted diver and bellman to sit, and for their umbilicals to be stowed neatly on racks, and the hatch to be opened inwards while they are inside. Anything bigger will make the bell heavier than it really needs to be, so all equipment that does not need to be inside is mounted outside. This includes a framework to support the ancillary equipment and protect the bell from impact and snagging on obstacles,and the emergency gas supply, which is usually racked around the framework and connected via manifolds to the internal gas panel. The bell umbilical is connected to the bell via through hull fittings (hull penetrations), which must withstand all operating pressures without leaking. The internal gas panel connects to the hull penetrations and the diver's umbilicals. The umbilicals will carry main breathing gas supply, a communications cable, a pneumofathometer hose, hot water supply for suit heating, power for helmet mounted lights, and possibly gas reclaim hose and video cable. The bell umbilical will usually also carry a power cable for internal and external bell lighting. Hydraulic power lines for tools do not have to pass into the interior of the bell as they will never be used there, and tools can also be stored outside. There may be an emergency through-water communications system with a battery power supply. The bell may also have viewports and a medical lock. 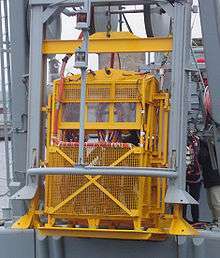 Diving bells are deployed over the side of the vessel or platform using a gantry or A-frame from which the clump weight and the bell are suspended. On dive support vessels with in-built saturation systems the bell is deployed through a moon pool. Deployment usually starts by lowering the clump weight, which is a large ballast weight suspended from a cable which runs down one side from the gantry, through a set of sheaves on the weight, and up the other side back to the gantry, where it is fastened. The weight hangs freely between the two parts of the cable, and due to its weight, hangs horizontally and keeps the cable under tension. The bell hangs between the parts of the cable, and has a fairlead on each side which slides along the cable as it is lowered or lifted. Deployment of the bell is by a cable attached to the top. As the bell is lowered, the fairleads prevent it from rotating on the deployment cable, which would put twist into the umbilical and risk loops or snagging. The clump weight cables therefore act as guidelines or rails along which the bell is lowered to the workplace, and raised back to the platform. If the lifting winch or cable fails, and the bell ballast is released, a positively buoyant bell can float up and the cables will guide it to the surface to a position where it can be recovered relatively easily. The clump weight cable can also be used as an emergency recovery system, in which case both bell and weight are lifted together. The bell umbilical is separate from the divers' umbilicals, which are connected on the inside of the bell. The bell umbilical is deployed from a large drum or umbilical basket and care is taken to keep the tension in the umbilical low but sufficient to remain near vertical in use and to roll up neatly during recovery. A bell cursor is a device used to guide and control the motion of the bell through the air and the splash zone near the surface, where waves can move the bell significantly. It can either be a passive system which relies on additional ballast weight or an active system which uses a controlled drive system to provide vertical motion. The cursor has a cradle which locks onto the bell and which moves vertically on rails to constrain lateral movement. The bell is released and locked onto the cursor in the relatively still water below the splash zone. As noted above, further extension of the wet bell concept is the moon-pool-equipped underwater habitat, where divers may spend long periods in dry comfort while acclimated to the increased pressure experienced underwater. By not needing to return to the surface they can reduce the necessity for decompression (gradual reduction of pressure), required to avoid problems with nitrogen bubbles releasing from the bloodstream (the bends, also known as caisson disease). Such problems can occur at pressures greater than 1.6 standard atmospheres (160 kPa), corresponding to a depth of 6 metres (20 ft) of water. Since the spider must breathe air, it constructs from silk a diving bell which it attaches to an underwater plant. The spider collects air in a thin layer around its body, trapped by dense hairs on its abdomen and legs. It transports this air to its diving bell to replenish the air supply in the bell. This allows the spider to remain in the bell for long periods, where it waits for its prey. Salvador Dalí once showed up to give a lecture in a diving bell, and insisted on speaking from inside it. ↑ Bevan, J. (1999). "Diving bells through the centuries". South Pacific Underwater Medicine Society Journal. 29 (1). ISSN 0813-1988. OCLC 16986801. Retrieved 2008-04-25. 1 2 Acott, C (1999). "A brief history of diving and decompression illness.". South Pacific Underwater Medicine Society Journal. 29 (2). ISSN 0813-1988. OCLC 16986801. Retrieved 2009-03-17. 1 2 Kilfeather, Siobhan Marie (2005). Dublin: A Cultural History. Oxford University Press. p. 63. 1 2 3 Bevan, John, ed. (2005). "Section 5.1". The Professional Divers's Handbook (second ed.). 5 Nepean Close, Alverstoke, GOSPORT, Hampshire PO12 2BH: Submex Ltd. p. 200. ISBN 978-0950824260. Wikimedia Commons has media related to Diving bells.